Use a yarn needle and the long tail to sew around the bottom and up the back of the body. If you wish, you may employ several pipe cleaners to form a boxlike skeleton to encourage a boxier shape. I measured and cut the pipe cleaners to twice the dimensions needed and twisted them together to make a stronger structure. It is good to fold the ends over about half an inch so the pointy wires don’t poke through the finished body. Insert the skeleton into the body. (I made a similar box for the head. I was going to make them for the legs – but the process is a bit tedious; I got lazy.) Stuff with polyfill. Using the tails from the cast on and bind off rows, sew the corner seams on the head. Poke the two ends from the antennae (if you made i-cord, thread one tail through the center of the cord to the other end) through the top of the head, and tie it firmly in place. Insert a pipe cleaner skull if it so pleases you, and stuff with fiberfill. Sew the head to the flap on the top of the body, and sew the top of the body shut. So you’ve already made the skinny little pockets for the claws. This is where the pipe cleaners are not optional. Measure the pipe cleaner against a claw, bending and cutting it so that there’s a little extra length on both ends. Fold the extra length at each end over so the wire can’t easily poke through your knitting. 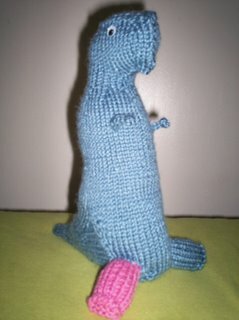 Insert the pipe cleaner claw into the yarn claw, and use a grey yarn tail to close up any gaps in the middle of the bend. Repeat this on the other arm. Using the black tail near the claw, sew the seam up the length of each arm. Sew each arm to the body using the black yarn, so that the seam faces downward and the arm is about level with the chest buttons. Poke in the ends and show all your friends. i said that i would post the robot pattern. lo siento. next time, for real. i'm going to shy away from more than two colors at once for several months. that got a little too complex at times. but oh, are they magnificent. the rexlace belt is completed as well... though i didn't finish it in time to melt the ends in with a butane lighter before i left home. my roommate (linden, the exploding rainbow) knit a belt using a double strand of rexlace and yarn - that might work better, just so's you all know. i'm currently working on a hat with waves, using SIX double pointed needles - not so portable, so it's coming along slowly. 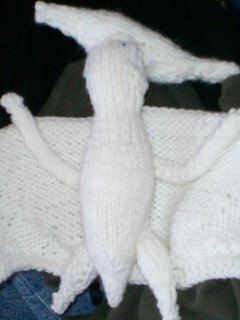 my other big project at the moment are the penguins that my aunt Deb designed and gave me yarn for. after that, we start working on the halloween costume. things are going well here in oberlin. the semester is underway, and i'm putting off work until Sunday, as usual. last night some friends and I went to see the Twins play the Indians at Jacob's Field. we (the Twins, of course) lost, but only due to a throwing error. i heard a newscaster say something about 'in baseball - a big win for the Indians last night'. not quite. there were a couple of drunken guys behind us for a while (i hate to use the phrase 'white trash', but it fits) who had been getting on my nerves for several innings. (i'm not into consistently taunting the opponents' left fielders), and one of them actually caught a ball that Gutierrez threw up into the stands. even in his lowered state of character, he gave it to a kid. i guess Anne Frank was right about people. after the game, there was an overstimulating display of fireworks set to music. couldn't hear half of the musical cues, but there were some neat explosions. this morning, Linden and i took the Lorain County Transit into Elyria and spent enormous amounts of money at craft stores. CLEARANCE YARN! i'm getting better about making yarn purchases with patterns in mind, but i'm still going on a yarn diet for the rest of the semester. (that means no more buying yarn. which i'm totally capable of. totally. of course, the evening ended with X Files! Gender Bender and Our Town, both wonderful cult-centered episodes. Gender Bender was especially awesome, because one of the actors in it (Nick Lea) shows up later in the series as a recurring character (Alex Krycek). this was the first time i've seen Gender Bender after knowing this information, so it was a pretty enjoyable viewing. i won't bother you with talk of the weekend's original X Files plans, not today. instead, i'll feed you some more iTunes. song (album) - artist format, as always. The pattern's done. The shrug's done. I have pictures. If only blogger would load them. Alas, not tonight. Perhaps I'll try again tomorrow. In the meanwhile, go read a book. Soon and very soon you are going to see the robot. I'm not sure as I want the pair to match, so I may come up with some variation of Mondrian's initials (PM) in the five or so colors he liked so much. I made this first one in under 24 hours, which makes me really happy. 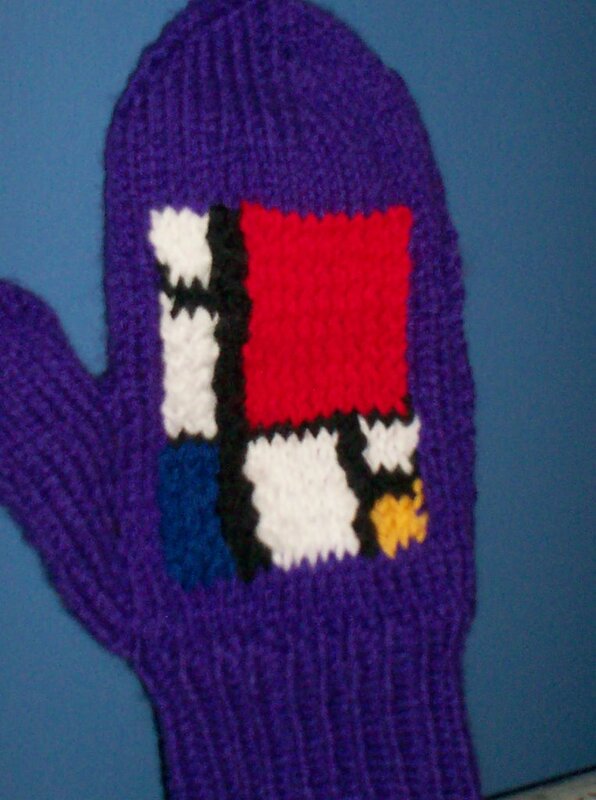 The world of mittens is intriguing. It almost makes me wish for winter to come sooner. Almost. 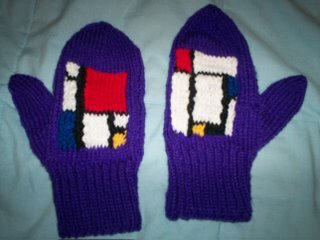 I'll post the intarsia chart whenever I get around to finishing and posting the robot. finals are coming up, and consequently, i should not be knitting and watching so much x files. but i did buy myself a little knitting knobby the other day, and have been making blue i-cord (leftover t-rex yarn) and have been pondering what to do with it. a friend suggested i make a series of flying spaghetti monsters to reflect the stages of picasso's art (blue, rose, and cubist). we shall see, we shall see. once i find my size fours again, there will soon be another pattern for you all to feast your eyes upon...inspired by the mental obsessions of brady higa. i wrote that back in mayish. and now its julyish. so it's outdated, and the robot (the aforementioned pattern that incorporates my size 4 dpns) is still unfinished, but coming along nicely. in other news, there's this neat shrug entitled 'Bobblicious' on Knitty, and i've started that in ravenclaw colors. the hogwarts set shall be complete before the summer's out. there's an abandoned rexlace belt still on the needles, which i suppose i'll finish one of these days. i've decided that perhaps a way to make myself blog more often and even regularly, is to go with this trend of using 'shuffle' on iTunes and listing the first ten songs that come up. here's this week's listening. i'll put them in song (album) - artist order for clarity. ...nothing too incriminating...i lucked out this week, i guess. 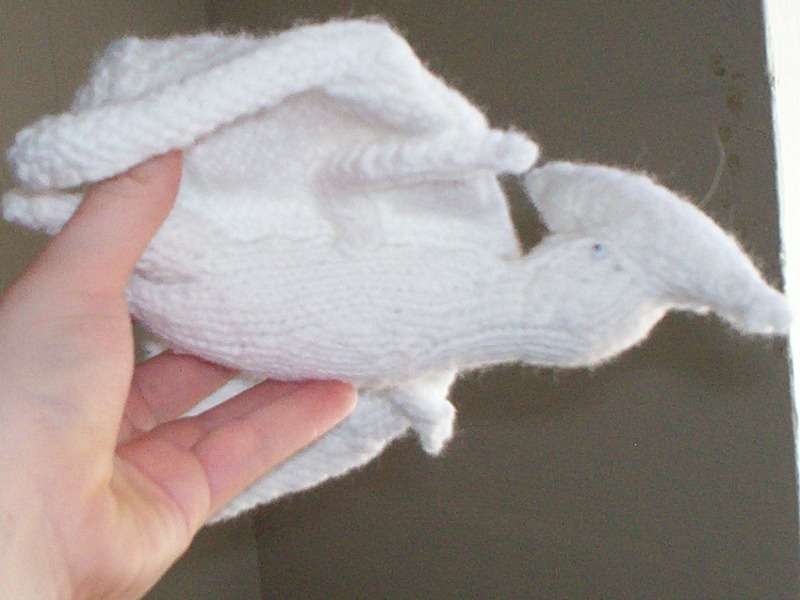 Now you don’t want your pterodactyl to turn out like Icarus, so attaching the wings securely is key. Fortunately, the centering part is easy, with that line of purl stitches down the center. So cut yourself a nice hank of yarn and sew down the edge of that purled column, and across the bottom, up the other side, and back to where you started. Tie a knot and poke in those ends. 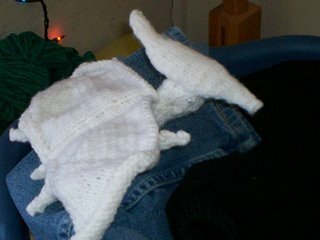 Stuff the legs, and attach them in a logical fashion, using the tail from the cast-on row if possible. Make sure they don’t stick out at too much of an angle, that would look a bit silly. Now comes the interesting part. That poky head thing. More seaming! So take that lengthy tail from the bind-off row and employ your yarn needle to sew the edges together, lightly stuffing. You want a little bit of polyfill, probably, but I feel like mine is too puffy. Not that overstuffing is a huge problem. You’re still making a pterodactyl, which will still qualify as equally amazing in most people’s minds regardless of the heftiness of that head plate. In the end you want it folded so that the seam you just made runs along the center of the bottom side, with the piece being relatively flat. One end should appear more rounded and shorter than the other. That’s good. 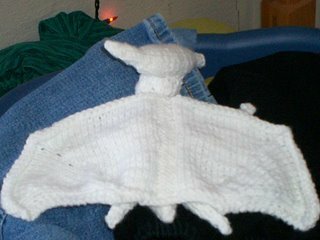 That goes in the front, so the other (pointier) side is closer to the wings. Using your stitching skills (honed in the rest of the Jurassic birdmaking process) sew this to the head, using the logical positioning skills that all of us have somewhere deep within us. (Careful, it is easy to sew it on a bit crooked. Then it turns out like mine, which is sort of looking off to one side. Which is cool, if that’s what you’re going for. But it’s not too hard.) Here comes the predictable refrain: poke in those ends! Get out your craft glue and stick on those humorous googly eyes. Probably two is good enough. One on either side of the head is a good rule. Sort of close to the poky head plate. But by all means, don’t let me stifle your creativity. If you want a Cyclops pterodactyl, or seven eyes, all on the left side, go for it. Show all of your friends/acquaintances, and send me pictures of your creation. Especially if it’s eye setup is unconventional. split 22 sts between 3 needles (I divided them 7, 8, 7) the rest is knit in the round. row 1: knit (6 sts), pick up 11 sts w/ empty needle (left side of heel flap) , knit them. knit across those needles you’ve been neglecting, then pick up 11 sts (right side of the heel flap) and knit them. sweet. tail time. i will no longer differentiate between needles, so get ready to count. cut the yarn; you’re doing wonderfully. leave a few inches for a tail, you don’t need much here. you’ll need two of these puppies. these are knit flat, you’ll seam them later. First, use the tails on the arms to attach them in what looks like good arm spots on the body. Basically just use the needle to thread each end through, and tie a nice knot. Then, stuff the tail and body up to the neck. If you’re using buttons for eyes, now would be a good time for attaching them. Use the yarn needle and the yarn end from beginning of the head to sew head seams. Then stuff the head, poking stuffing in through the neck. Then sew the neck closed. Tie a small knot and poke the end of the yarn inside the beast. Finally use the leg yarn ends to sew around the bottom of the foot and the side seams of the legs. Stuff them, and attach them to the body in a logical location. Keep in mind that the legs and the tail sort of form a tripod of support for this fellow when you’re placing your legs. Attach googly eyes to the head with craft glue, using your logical placement skills once again. Or glue them to your buttons if you desire obnoxious eyes. That could look pretty cool. Go take pictures of your new buddy and show all of your friends. They will be amazed and ask you if you’ll make them one. Smile, and shake your head. 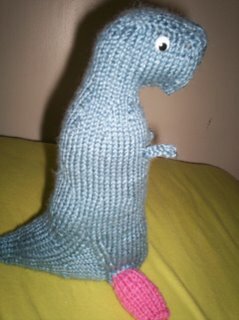 Tell them to knit their own damn dinosaurs. This one’s yours. Send me a picture of your t rex. The main intent of this page is the sharing of joyous ideas and thoughts, particularly those that pan out into something tangible, like knitting patterns. Perhaps it will make me continue to do interesting things so that the world doesn't perceive me as boring. I'm a bit hermity at times, especially on breaks, but this could definitely be entertaining. We're going to kick off the site with possibly the most amazing thing ever, which of course, refers to a knitting pattern; my first design, in fact! Tyrannosaurus Rex! For Advent! With a pink leg! And googly eyes! This all started when I was surfing around looking at knitting patterns online and I came across some awesome stuffed dinosaur patterns (click on 'salutations' for the link). I got this idea in my head to make a set of dinosaurs to match the colors of the liturgical calendar (a Protestant thing), and that three would not suffice. Hence, the tyrannosaurus rex. There might be another coming soon; we shall see. Overall, I'm quite pleased with it. It will be up as soon as I figure out a reasonable posting method.